As soon as I returned from Paris after the premiere of Les Miserable in Concert I began building our booth from my design on paper for the Chicago Art & Design Show at Navy Pier's exhibit hall. A very busy month and a half to say the least. Really loved being in Paris to see my little Cosette being used for this European touring musical production. Was very humbled and it meant a lot to me when the producers Philippe, Magda and the entire cast applauded me for in providing them my image of Cosette for the use in their production. The performance was spectacular and will never forget that moment. Nor will I forget all that I and Mari Jo did in such a short amount of time even with it being cold and rainy 99% of the time. We were able to hit The Palais Garnier (The Paris Opera House) where many of my Phantom of the Opera pieces took place. We could not leave without visiting the Eiffel Tower, Notre Dame and of course the Louvre where many of my hero's works are displayed. They had two marble sculptures by Michelangelo there and stood for a very long time absorbing the one artist/sculptor that was my greatest inspiration growing up. l stood there looking at every chisel mark by this the greatest sculptor of all time. I followed that which was not finished next to that which was and could see what he was seeing beneath the stone. Another moment I will never forget. Thank you to everyone in Paris for all your kindness and generosity especially Philippe Barreau and Magda Hadnagy of CITYPROD in Paris in making me and Mari Jo feel so welcome. We enjoyed meeting you and can't wait to do it all again sometime soon. Outside the Palais des congrès de Paris on the day we arrived. The Palais des congrès de Paris lit up at night. Taken an hour before the show started. Inside the Palais des congrès de Paris an hour before the show started. Found my little Cosette everywhere including on this women's tote bag. Ahhhh... How sweet it is! Mari Jo & I share a very powerful weakness ... Macaroons!! The one artist I admired more than any other growing up was Michelangelo. This is one of two marble sculptures they have in their collection at the Louvre. Some hot chocolate on a cold and rainy day at a pastry shop across from Notre Dame. Artist Bradley J. Parrish will be in attendance at the Chicago Art Show at Navy Pier on April 8th & 9th. Brad who values his “painting time” over his “gallery appearance time” is taking this opportunity to be a part of the first art show of its kind in Chicago at Navy Pier in this the beginning of spring to debut and make available to the public/art collectors some of his award-winning and highest prized paintings ever created by the artist. His original works at this show will include paintings like his piece titled “Still Water” selected by ARC or (Art Renewal Center) in last year's international art competition as one of the top paintings in the world. At this art show, Brad plans to unveil to Chicago and to the world his latest oil painting on linen titled “Eve-In Defiance of God” which measures framed 6ft wide by 8ft high. All of Brad's original paintings at this show will not only be able to be seen in person for the first time since their completion but will also be available for purchase. Brad has agreed to the art show officials to be painting during the event, giving those attending the show a glimpse into how Brad works. Brad says he is excited to be back in Chicago and looks forward to meeting all of those attending this art show. It was a wonderful surprise that I had received an unexpected call from Magda and Philippe from CITIPROD in Paris last month asking both Mari Jo and me to be their guest at the premiere of their new musical production titled "Les Miserables en Concert" at the Palais des Congrès in Paris on March 3rd, 4th & 5th. Very happy that they saw in my painting of Cosette what I felt when I painted her back in 1994. Between my love of Victor Hugo's novel titled Les Miserables and the music of Alain Boublil and Claude-Michel Schönberg who adapted his novel into a musical masterpiece that it is still even to this day, inspiration has been abundant for me to work from. Kudo's to producer Philippe Barreau for producing this musical in the French language as it was intended to be sung and heard. I had, unfortunately, never took French in high school and today more than ever I now wished I had. Like most of my school years, I was always drawing on blank white sheets of paper hidden between the pages of my school books. Mari Jo and I leave on March 2nd for Paris and think with the limited time we are there that I will only be able to bring my sketch pad, maybe some pastels and my watercolors... Watercolors which I haven't worked in since high school.some 30 years ago. Will keep you up to date if I get a chance. Front Page Cover Story: Brad and his painting titled "North Pole Express" featured in the Milwaukee Journal/Sentinel. 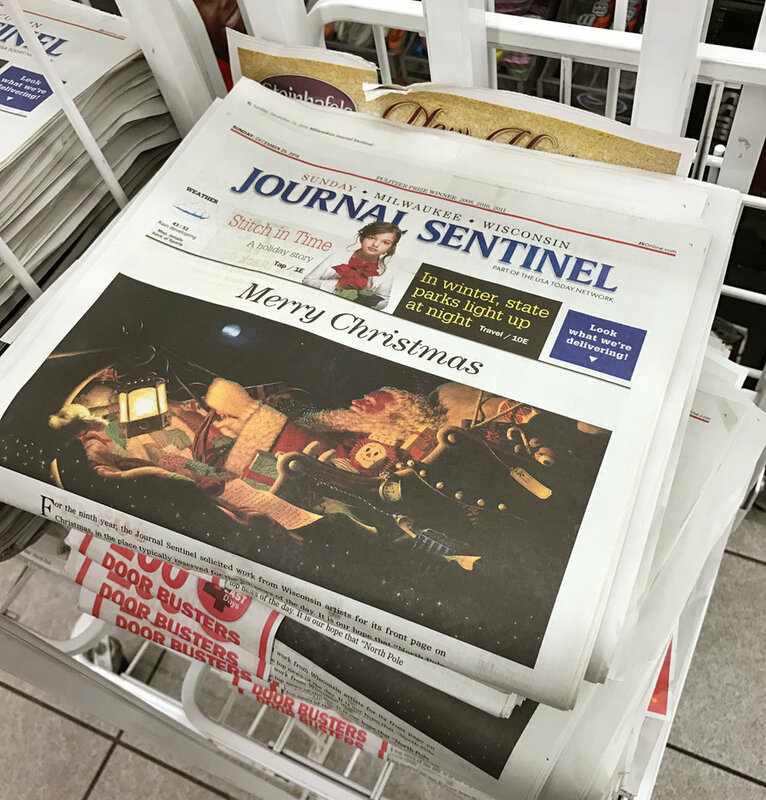 Like a child anticipating the arrival of Santa Claus was I as I silently waited for the Christmas morning Milwaukee Journal Sentinel to arrive on the newsstand. Silently, as the Journal staff requested I keep my winning under wraps until the publication of the Christmas morning newspaper. As the article indicates, I entered the contest along with 80 other entrants. I was made aware of my winning entry, North Pole Express via an email just last week. While all the national and international accolades are wonderful; it is indeed an honor for me to be recognized in my own home town. I am truly humbled by the photos on Facebook in seeing my painting of my little Cosette on posters in the streets and in the subways of Paris promoting the new major French musical production of Les Miserables where it begins its national tour. I agreed to licensing her to this musical production company in Paris as I feel my Cosette's face embodies all of which is Victor Hugo little Cosette. Furthermore, I am proud that she stands with, and for all the magnificent talent coming together on the French stages in bringing this musical masterpiece to so many people. Les Miserables starts their tour in Paris this coming March. Link to one of several pre-production videos: https://www.youtube.com/watch?v=jA90NOMhkm4. The most prestigious realist art competition in the Americas and perhaps the world has chosen my painting titled "Still Water" in the 12th International ARC Salon Competition as a finalist to be included in their soon tho be published international catalog. This year they had 1,006 finalist works by 640 artists from 63 countries, representing 32% of works submitted. The thousands of artist's that enter this international competition bring forth great works of art that inspire us all. The best of the best are featured in this catalog. My taboret if I wore one, would be removed in respect and honor as a result of these artist major achievement in reaching the level they have. My congratulations to all my fellow artists who have earned a place in this international competition. I have won awards and have been a finalist several times now over the years and always look forward to this international compatition. A Couple of The Many Questions I Get Asked all The Time and Here Are The Answers. Question 1: What is the smallest oil painting you ever painted? Answer: The two paintings I did for the shadowbox called 'A Date With Destiny". Each of the small paintings measured 1' w x 1 1/2" h. One painting overlooking Paris from inside our hotel room and the other painting of my love in her wedding dress with a view of Paris in the background. Question 2: What is the largest painting you ever painted? Answer: It would have to be the mural i did in 2004 for my children's elementary school. The school had asked me is i could help them created a climbing wall for the children. All three of my children attended this school and donated all my time to designing and painting this for them. I even had the kids help paint the fish in the mural so that they would forever remember this experience they had. The mural if i remember correctly measured 40' h x 60+ w.
A lot of good past memories of all of our pumpkin carving parties over the past 25 years. I say 25 years because prior to the kids being born we got together with a couple family members and friends to carve pumpkins. After the kids were born it became a big event each year inviting friends and families. It grew and grew and became quite an annual event. Each and every year as the leaves began to fall; my kids would rally around me to start getting the Halloween party stuff up for the party. Halloween and Christmas have always been two of my favorite holidays however, having my children all getting so excited about these two holidays has always made it “Oh, so very special!” They loved everything about the concept of a Pumpkin Carving Party from the get go. First, everything about it is unbelievably fun and fantastic! All their friends were coming over to their house dressed up in costume for carving pumpkins and for playing games. They got to eat Dirt Cake, Brownies, Candy, and Chips including all the soda and punch they want to drink. And none of them will forget the Haunted Hey Ride back in the field with creatures chasing them in the dark. It was so nice to see all these children grow each and every year. In 2010 we had our last party. It was sad to say the least. The once little kids are now all grown up. I’m thankful every year about this time for all happiness we have all enjoyed during this holiday, the opportunity to share this special holiday with all our friends and their families. These Halloween pumpkin carving parties I know will live on in the hearts and memories of all these kids and someday one or more of them will do the same kind for their children. This was our annual invitation to the party. 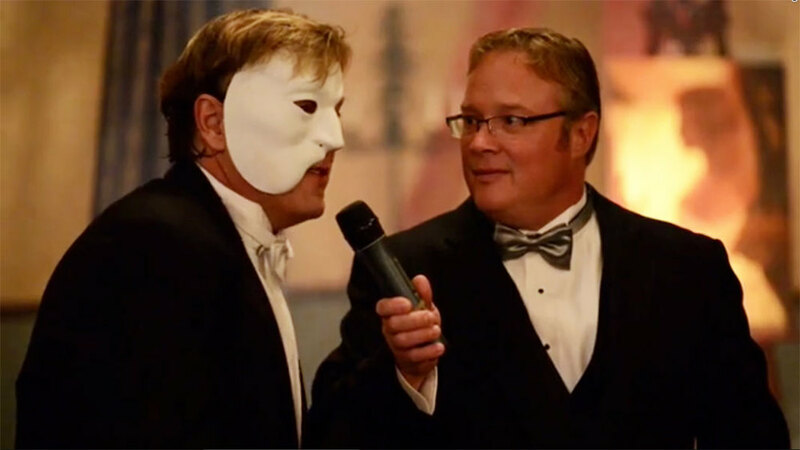 I cant believe that two years have past since I accepted an invitation to put on an artistic performance in Oconomowoc Wisconsin to benefit OPEF which is short for the (Oconomowoc Public Education Foundation). I have done this before many years ago to help the "Southern Maryland Wildlife Foundation and it really helped them out. Here i am helping those out in my own state, feel good about that. Designed and built the set and choreographed the performance arounda painting I did of my fiance as Christine (The Phantoms Angel of the Night) especially for this fundraiser. As the Phantom I brought MY Angel of the Night to my studio below the Paris Opera House and painted her portrait on stage before a jam packed ballroom of geusts and contributors to the OPEF cause. I OPEF was auctioning some of my "Opening Night" fine art limited editon prints after the performance as well as my original oil painting unveiled on stage that night. The whole effort was a big success for OPEF. Here I was being asked questions by the MC after Mari Jo and my performance. Oil on canvas painting I did of Christine (Mari Jo) which was unveiled on stage during the performance. I had just finished the painting 15 minutes before the performance. Photograph I took of my beautiful Mari Jo as (Christine) right after the performance had ended. Three of Brad’s paintings have been chosen from over 2500 entries worldwide to be featured in the 2014/2015 Art Renewal Center or “ARC” international Salon catalog. 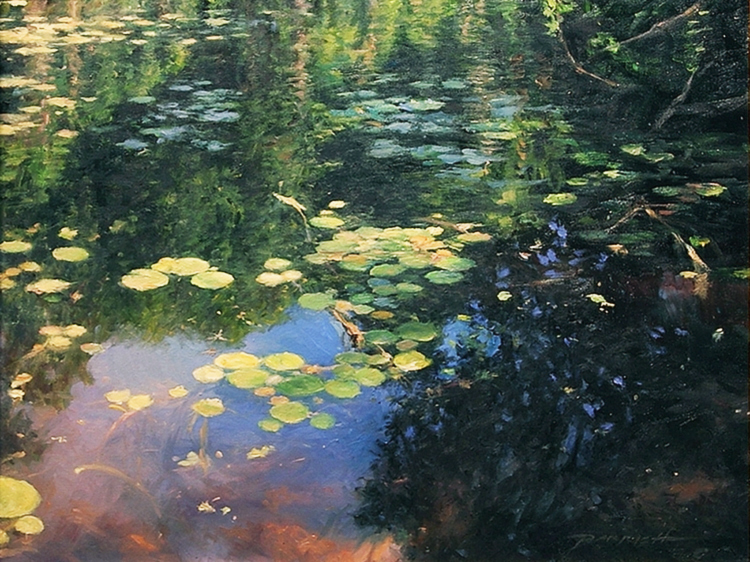 Several of Brad’s works have taken top honors on two separate other occasions over the years when he had entered this competition which also showcased his work in previous ARC Salons international competition catalogs as well, works such as “Creation of Heaven & Earth”, “Passing Showers” and “Whispers of Love”. The three Parrish recent paintings that were selected by this year’s panel of judges are “Creation of Heaven & Earth II”, also “Cedar in Silhouette” and “Creation”.